A man who released dozens of goldfish into a Dutch canal has been told he has to scoop them out again. The Netherlands Enterprise Agency (RVO) has given Hans van Manen one month to pluck the creatures from the waterway in the central town of Veenendaal, De Gelderlander news website reports. The fish have been swimming around in the canal since June, when Mr Van Manen decided to release them to create a local attraction with the support of nearby businesses. In total, 280 fish were released - a mixture of goldfish and another similarly orange species, golden orfe. 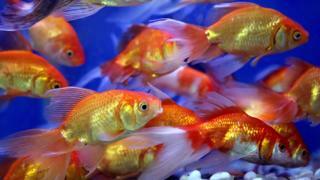 The RVO order only applies to the goldfish, of which there are 80, according to De Gelderlander. The RVO stepped in after a complaint from a conservation group which works to prevent the introduction and spread of invasive species. Officials say the release breached the law protecting native flora and fauna, as goldfish eggs could leave the canal through a drainage system that's connected to other waterways. There was also a concern that it could lead to interbreeding with native crucian carp. If Mr Van Manen doesn't act then agency officials will catch the fish and bill him for the trouble, but he tells RTL News that although it's a "real shame", he will abide by the decision. "As experts say it's bad for the other animals in the area, I respect that," he tells the site. "I did this out of love for animals." He's hoping to sell the goldfish - which he says have grown well in the canal - and use the cash to buy more golden orfe to replace them.